Digital Luxmeter MS6610, 0.0 Lux to 50 000 Lux, MASTECH Compact digital lighting meter (luxmeter) MS6610 from Mastech designed to quickly and easily measure the intensity of light in workplaces and premises where a range of 0.0 lx to 50.000 lx is required. Data retention function. With a HOLD button which allows to stop the measurement and display data from the last measurement. 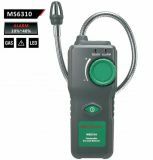 MS6310 Combustible GAS detector With MS6310 it is easy to detect gas leaks. Alarm at 10% - 40% Level. It detects: natural gas, methane, ethane, propane, butane, acetone, alcohol, ammonia, steam, carbon monoxide, gasoline, jet fuel, hydrogen. Digital handheld thermometer MS6512 for thermocouple type K, J, T, E Handheld thermometer MS6512. Large Dual LCD Display. Resolution: 0.1°C, 0.1°F, 0.1K. Built-In Ambient Temperature Compensation. MS2302 Digital Earth resistance tester, 0.01 Ohm - 4000 Ohm MS2302 Digital Earth resistance tester with measure range 0.01 Ohm - 4000 Ohm. 2 Pole / 3Pole Measurement Modes. Earth resistance measured by constant current inverter 800Hz/3mA. MS5209 Analog Earth resistance tester, 0.1 Ohm - 1000 Ohm MS5209 Digital Earth resistance tester with measure range 0.1 Ohm - 1000 Ohm. Earth resistance measured by constant current inverter 800Hz/2mA. MS2308 Digital Earth resistance tester, 0.01 Ohm - 1000 kOhm Advanced portable meter MS2308 for measuring earth resistance. 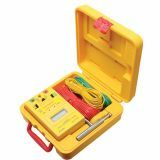 Earth Resistance Tester, digital, 8PK-ST1520, Pro'sKit Earth Resistance Tester 8PK-ST1520 with measurement range 0.01 Ohm - 2000 Ohm. Capable of measuring earth voltage. With small measuring current of 2 mA for no tripping of earth leakeage current circuit breakers in the circ\uit under test. 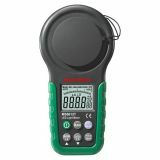 Digital Tachometer MS6208A Digital tachometer MS6208A for speed rotation measurement of 50-1999 RPM. 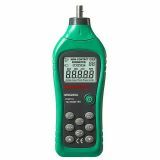 Moisture Tester MS6900 , range 0 – 90% Moisture Tester MS6900Great for measuring moisture content in different materials. Ambient Temperature and Relative Humidity Measurement. Moisture Detector with protective cap MD, Brennenstuhl, 1298680 Humidity detector with protective cap with large LCD display (in percent, resolution 0.1%) used to determine the moisture content of wood or building materials such as concrete, brick, screed, plasterboard, wallpaper. Practical "Hold" function. Measurement range of 5 - 50 % for wood or 1.5-33 % for building material. 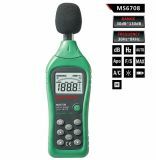 Digital sound level meter MS6702 with temperature and humidity MS6702 environmental meter. Sound Level Range: 30dB - 130dB. Digital sound level meter MS6708 , 30dB - 130dB Digital sound level meter MS6708 30dB - 130dB, 4 digits LCD display with 50 segments analog bar graph & backlight, Data hold, Max /Min value measurement. 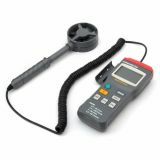 Anemometer MS6250, LCD (1999) MS6250 wind speed tester. Functions: data hold function, LED display 1999 digits. The anemometer is very useful in air flow and wind speed measuring in ventilation and conditioning systems design. It is used for meteorological purposes. Digital Anemometer MS6252A, 0.4 - 30m/s, CFM, CMM, CMS Digital Anemometer MS6252A. Decibel meter 10-0-2dB Analogue decibel meter 10-0-2dB M13 80x80mm. Luxmeter MS6612T, range 0~200 000Lux, 0~20 000Fc, 0~999 900Cd Luxmeter MS6612T, range 0~200 000Lux, 0~20 000Fc, 0~999 900Cd. 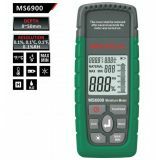 Handheld multimeter MS5900, phase rotation indicator The MS5900 is effective for measuring phase rotation in all areas where three phase supplies are used to feed motors, drives and electrical systems. LED indication for rotating status. Clamp-on Ground Resistance Tester MS2301, 3700V Portable MS2301 ground resistance meter, get ground resistance result safely and easily by clamping the ground line. Test voltage 3700V. MS6208B Digital Tacho Meter, 19 999 RPM, MASTECH Tachometer MS6208B compact digital device for measuring the speed of the object in a contactless manner by means of the sensor PHOTOS (fototahometr). Measuring range up to 19,999 revolutions per minute (RPM). It allows you to quickly, accurately, safely measure the amount of r / min without touching the object.